Green Beaver Sunscreen is one of our 10 Makeup Must Haves. See the full list on The Well. Very greasy, however, I just looked at it like tanning oil of my youth. The natural smell was not to nice but that's what you get when you choose fragrance free. Worked very well, no burn for myself or my ginger babies. Yes I'll use it again. Very greasy and I couldn't stand the smell. Make sure you shake the tube before using it. First time I used it, the oil went out first. Very Very Oily. Def will not buy again. Sorry for the bad review. It's definitely not whitening which is great. It is a bit greasy so I don't use it on my face (use a facial sunscreen) but it rubs in easily, works well and is water resistant so it is still my favourite sunscreen for the whole family. Ingredients are great and no nano particles. Will buy it again for sure. Really effective, only needed to apply it once before going out fishing for an afternoon. But does go on really thick. I've tried a few non toxic sunscreens and I've hated the way they blended in. Being a person of colour, it's important that the sunscreen blend in properly and not look like clown makeup. This one worked wonderfully! I've been very satisfied with this purchase and have bought more for my my kids as well. Our family loves this product. Unlike most other zinc-based sunscreens, this product doesn't turn your skin white. You have to be aware that the product is oil based, so it can get in your hair, but I like the fact that it will keep your skin moisturized as it's protecting you from the sun. It really is non-whitening, but a bit greasier as a result and remains sticky for a while after application. But worth it for a chemical free sunscreen that works! Great for sensitive skin. Like most suntan lotions, it is a bit oily, but it doesn't sting or feel like you were basted and glazed like a doughnut. I shake it up before using it. It doesn't spread the best, but that is because they do not add phthalates or parabens, so I'm ok with that. Make sure to massage the tube before using or all the oil comes out first! I don't mind the extra greasiness in exchange for a non-toxic,green Canadian product. I completely understand how everyone thinks this sunscreen is greasy but as one of the other reviewers point out there are criteria for a good sunscreen...and remember we aren't wearing sunscreen for fun it's so we are safe from the sun! I love this product - I use it on my face and my children's face because it is completely unscented (I also bought Goddess Garden Sunny Body Natural Sunscreen which I use on our bodies because it is more economical - but I would never use it on my face as it's definitely got some kind of scent). I was on the hunt for a non-whitening sunscreen that did not use nano particles. This fits the bill perfectly. It rubs in perfectly in seconds - I was so thrilled when I saw this! Perfect formula and I can feel good about using it on my kids skin. I noticed some of the reviews said this was greasy so I rubbed this into one arm and the Goddess Garden formula into the other arm - once it's rubbed in, the Green Beaver one does look slightly greasier, but I wouldn't have noticed it if I wasn't staring at my two arms comparing it - so that wasn't an issue at all for me. This product was extremely greasy and smelled bad. We won't be using it. Non-whitening. Great for kids...as it is natural and not chemical based. I prefer Badger (not as greasy)....but I do support Canadian made and have been buying this for the last 2+ years. The product went on really well but was really greasy. After an hour or so I was burnt and I had applied the sunscreen to that area. I will give it another try because I want to support a Canadian made product. I love this phenomenal sunscreen! Was snorkeling for hours in Roatan, Honduras, with only this on my legs and did not burn AT all, and I'm fair-skinned and freckled. I don't agree with other reviewers who are turned off by it being thick and greasy. I wore it all over, even my face, and it absorbed without a trace of residue. I've tried other natural sunscreens and believe this to be the best. Go Canadian, Go Green Beaver! The criteria for a good natural sunscreen are: 1. high zinc content, 2. non-whitening, 3. easy to apply, 4. water-resistant, 5. no harmful ingredients (preferably beneficial ones), 6. cosmetically acceptable (i.e. doesn't make you look weird). This sunscreen meets all of these criteria, while no other natural sunscreen I've tried does. If all you care about is having a natural sunscreen, this is a great product. I need more. This product is beyond greasy. I would never put this product on my face, and I could not imagine putting it all over my body while wearing a bikini. You feel gross no matter how much of it you have on. Sand, dirt, even black flies stick to you because it is so thick and greasy. Will not buy again. Simply way too greasy, my face broke out in zits after wearing this. We have been very happy with this sunblock. I have very fair skin and have been out with my kids all summer wearing this and haven't had a single sunburn. It is a little greasy compared to traditional sunblock, but I'll take that over the unknown chemicals being absorbed into my skin. Highly recommend. I only used this once, never again. It stung my skin and it was so greasy I had to use 3 products to remove it. Smooth and sinks in quickly not leaving too much white. Smells nice too, not too strong. A little oily, not sure I would use it on my face. Very natural though so gets extra marks for not baking chemicals into my skin. as previous reviewers mentioned it is a bit greasy, but not white and spreads really well and its not hard to wash off. The face version is not greasy at all, so defintely use both products. I have severe allergies and this is the only product that I can use. Grest stuff. This stuff is incredibly oily and smells like sunflower seed oil, but it is GREAT as a waterproof sunblock for swimming. I don't even need to reapply after being in the water, and it's still effective. Greasy, but good for swimming. Otherwise I prefer the spray version. This a great mineral-based sunscreen. It does not make your skin white like other mineral-based sunscreens that I have tried. I use this as a facial sunscreen. It is greasy, however on the positive side I have found that my skin feels nicely moisturized and looks refreshed. Another nice bonus is that is a Canadian product. I love this product. 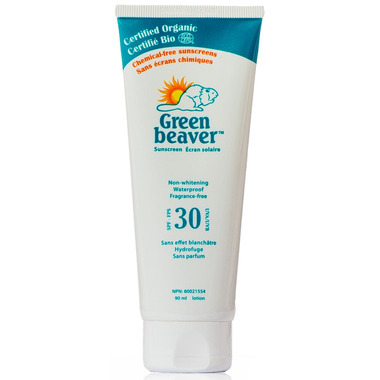 I've tried many natural sunscreens and my search ended when I found Green Beaver. I work the product in the tube for 30seconds or so, then squeeze the product onto my hands and rub between my two hands to disperse. I love the smooth texture of it and it is truly non-whitening. It smells great and our whole family uses it. Initial impression is that it is very greasy and is an off white slightly yellow colour. It is nonscented but unfortunately there is a scent to the cream that isn't very appealing. Therefore I'd think most people will be turned off by the consistency, colour and scent. I applied it on a beach day and but noticed patches of burnt areas on my legs and arms. I'm sure I applied it evenly but it it seems the like from the other reviews that the oil and active ingredients can separate leading to a false sense of coverage. Therefore I wouldn't recommend this cream because it strives too hard to be mild on the skin that it does not provide adequate sun protection. Very greasy, and hard to wash off after. I guess this would be good for swimming, but not a nice feeling at the end of the day. Still happy about what is in the product, though. This product rubs in well and is non-whitening, unlike so many other non-toxic sunscreens. The drawback is that it's extremely greasy and rubs off on clothes. This stuff is great and is Canadian as well. Of the non-chemical sunscreens we like this one best. It is a little greasy but I can work with it. Will repurchase. 3/5 Lives up to the non-whitening promis but it is very greasy. I don't have the expectation that any water resistant natural sunscreen will come without any draw backs but there are certainly similar natural sunscreens out there that are far less greasy. Another great product that I trust to put on myself as its gluten free and for my kids is 100% natural and organic :) :) Its a bit greasy, but my kids don't mind it. Really like this sunscreen! Have used natural sunscreen for many years now and just switched to this brand. Have been very happy with the texture, and how well it rubs in. Have used heiko brand and it was great but took alot of rubbing in and left a white look to us. Well.ca delivery on this item was super fast. Customer service was incredibly helpful with a few questions. This is beyond greasy! It looked like I dumped a bottle of vegetable oil all over me, and felt about as good. I was so disappointed in this product. After using it once, it started to separate so all that came out was oil and no lotion at all-I tried kneading the tube to solve the problem but it stayed separated. I will not be buying this again, I feel like I threw away my money! Is extremely greasing! My daughter leaves the house with a shiny greasing looking face and gets all over clothes. I won't be buying this again. I'm happy with this product. Surprisingly clear (although it's advertised as non-whitening I thought it'd leave some white residue) and easy to apply. I wear BB cream and blot powder on top and I'm set for the day. It is oily. It's expensive, and you should get more for the price. But it does work, and it's nice to have a non-toxic alternative! So far the best natural sunscreen I've used - fragrance free and doesn't turn me (and my clothing) whiter than I already am:) The bit of oilyness doesn't bother me and this feels nice on my face even. As others have mentioned I do wish that I received a little more product for the price. 4/5 stars. Love this sunscreen. it works to keep from burning and even when you sweat it doesn't get all slimy. Took this down south with me because I burn easily. It was amazing! I was surprised that it worked so well even after going in the ocean and not reapplying. Would definitely recommend it! It is a little greasy but it absorbs well. C'est ma crÃ¨me solaire prÃ©fÃ©rÃ©e! Ayant la peau sensible et recherchant les produits pour le corps les plus naturels, c'est la solution parfaite pour moi. Je n'ai aucun aucun coup de soleil durant mes vancances au Mexique, cette crÃ¨me passe le test haut la main. La texture est toutefois assez grasse, mais nul besoin d'en mettre beaucoup. Pour le visage, j'utilise plutÃ´t la crÃ¨me solaire visage de la mÃªme marque, accompagnÃ© d'un chapeau et le tour est jouÃ©. Aucun effet blanchÃ¢tre et trÃ¨s rÃ©sistant Ã la sueur. Vraiment, un excellent achat que je renouvÃ¨le sans hÃ©siter. I use this product because it's toxin-free. It's very greasy, but non-whitening. It works well to prevent sunburn. I wish it were less expensive. Great product. Does not go on white so you don't have that whitening look. Slightly a bit greasy so it does give your skin a bit of a shine. Great product though. Can't complain. Wish it came in bigger bottles!